The news is exciting for 2011 Media MFA alumna Kate Riegle-van West! On Saturday, November 16, between 10:30 a.m. and 12:00 p.m. EST, Riegle-van West will be giving the talk of her life live from Boston as part of TEDxBeaconStreet’s 2013 Conference. She will speak of and perform with the Orbitar, a performance device she created as part of her work at Columbia. Click here for the broadcast link – Riegle-van West will likely begin her segment sometime after 11:30 a.m. EST. 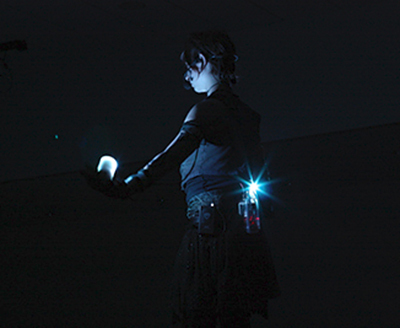 Riegle-van West developed the Orbitar (click here for a more detailed description) as a Poi-spinning inspired tool she calls a “satellite” that allows a performer to spin the satellite while controlling changes in media such as sound and video through combining controls in a pair of gloves. Riegle-van West, with the help of collaborators Jacob Fenwick, Jordan Stefanelli, and Natan Wythe, created the Orbitar as a DYI device that uses materials including and Arduino Fio, Orbitar board, and accelerometer. 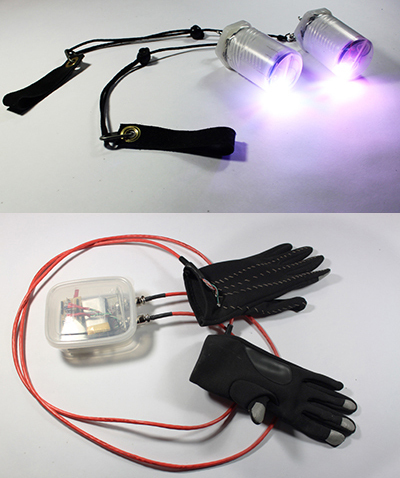 The device is programmed using the Arduino in combination with Max/MSP to activate media while the satellite spins, with user-activated points on the gloves to send wireless signals (click here to make your own Orbitar!). The project evolved during the second half of her education at Columbia. Riegle-van West had been Poi Spinning (click here for more information on Poi Spinning) for several years, and had originally not known if or how she was going to use her experience in her graduate work. She credits her late professor Jeanine Mellinger for support in helping Riegle-van West recognize her potential to combine the conceptual and technical advances she made as a graduate student with her Poi-Spinning skills. Her first exhibition of the Orbitar Satellite was four-channel video work shown on 33 E. Congress Street in Chicago in 2009 that she did as part of the “Space and Place” class at Columbia taught by Mellinger. The video (click here to watch) shows Riegle-van West using the Orbitar Satellite to create geometric forms. This video was also one of thirty-six finalists at the Digital Graffiti Festival, an international festival where videos are projected on buildings in Alys Beach Florida in 2010. She continued to work on the Orbitar and then used the satellite as a main feature in her thesis. Riegle-van West moved to the Boston area and is a flourishing interdisciplinary artist on many fronts. The Orbitar is just one of her many projects. She currently works at Harvard doing various design work as well as managing an archaeology program where she created a website and database from scratch. She also is on the HONK! Festival (www.honkfest.org) organizing committee, where she does design and web work. In addition, she plays in two bands (www.secondlinebrassband.org, and www.ensmb.com), which she made websites for and helps manage various other media aspects. She connected to TED through helping film a segment for the PBS show Design Squad. When the production manager of the PBS show filmed a TED talk segment, the head of the local TED event asked him if he knew anyone that would give a good talk. He recommended Riegle-van West. “And just imagine, at a time when we are fighting to keep the arts in our schools, if easy to make, affordable, and easy to use Orbitars were in every classroom. Imagine seamlessly integrating movement and music into the study of geometry, the laws of physics, computer programming. Clearly, Riegle-van West is poised to greatly expand the horizons of those who watch her TED talk this Saturday. Stay tuned for the bright future of a shining interdisciplinary artist! Next Article Planting Day in Papermaker’s Garden this Week!